Psoriasis raises the risk of type 2 diabetes depending on the intensity of the skin disorder. 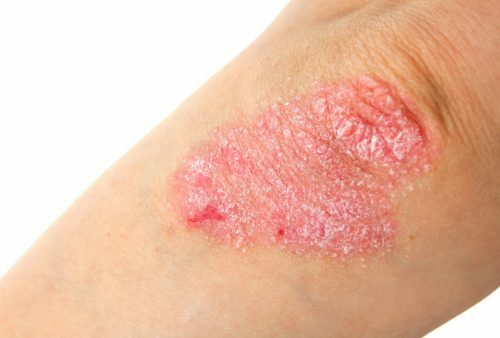 Psoriasis has been found to be an independent risk factor for type 2 diabetes, with a much greater risk found in those with severe psoriasis. The researchers estimate 115,000 individuals will develop type 2 diabetes based on their risk of psoriasis alone. Psoriasis is an inflammatory skin condition, which causes the skin to become thick, inflamed, and scaly. Psoriasis has also been associated with myocardial infarction, stroke, metabolic syndrome and cardiovascular mortality. The study compared 108,132 psoriasis patients matched with 430,716 controls and uncovered that patients with mild psoriasis had an 11 percent higher risk of diabetes compared to the matched controls. Those with severe psoriasis had a 46 percent higher risk of diabetes, compared to the controls. Other findings uncovered that psoriasis patients with diabetes were more likely to require medication treatment for diabetes, compared to diabetics without the skin disease. Additional research is required to determine the effects of psoriasis treatment on potentially lowering the risk of type 2 diabetes. It may seem odd that a skin condition would be associated with diabetes, but the two diseases actually have many aspects in common, which explains the link a bit more. For starters, both increase inflammation. Inflammation as a result of psoriasis can increase the amount of insulin-like growth factor in the body – which is linked to diabetes. Psoriasis also impacts the immune system in ways that affect insulin, leading to diabetes. Psoriasis and diabetes also share common health conditions, including obesity, higher body mass index, high cholesterol, high blood pressure, cardiovascular disease, and stroke. Lastly, psoriasis and type 2 diabetes also share many common lifestyle factors that affect either condition. Shared lifestyle factors include smoking, drinking alcohol, and unhealthy eating. These commonalities between the two conditions offer some insight on how one plays into the other. Therefore, by controlling the factors you can control, you can prevent or better manage psoriasis and type 2 diabetes.